This Friday Favorite with a Flair includes two Essie Favorites. Essie Mint Candy Apple and French Affair. I LOVE pastel nail polishes and these are such pretty colors. Mint Candy Apple is probably one of Essie's most popular shades...It's a perfect mix of blue and green and was opaque in 2 coats. And French Affair is a cute light bubblegum pink - it was a bit more sheer, but nothing I can't handle:) I think they look great together too! 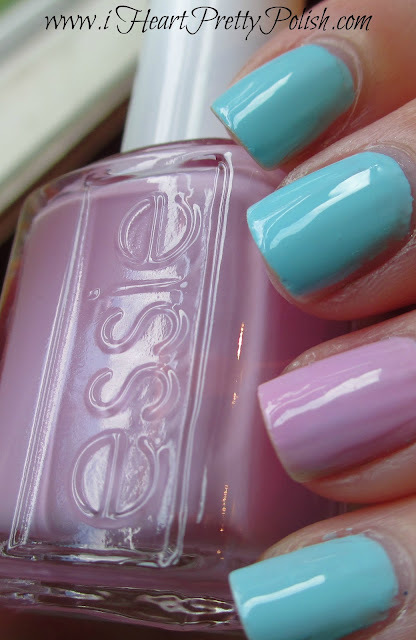 What are some of your favorite pastel nail polishes? This is gorgeous! I need to go get Mint Candy Apple right away. Very cute, I love MCA! My next favorite would probably be Essie Borrowed and Blue. I love Borrowed and Blue too! Ohhh, I LOVE that pink! And yes, they do look really pretty together. My favorite pastel is the only light pink in my collection-- L'Oreal Penthouse Pink. You only have one light pink??? OMG, light pinks are my weakness. I would never think to put those two together but it works. Just lovely!! I really like French Affair. Such a pretty color! Yes, and it applied pretty easily too. Not the case with all Essie's.